Where do you want to go birding in Alberta today? ...Banff National Park - Birding - also see this alternate site. information sheet. Beaverhill Lake, located 70km east of Edmonton, Alberta, is an exceptional site of critical habitat for a wide variety of species. sanctuary has been designated as one of Alberta's "Special Places". Trails wind their way through marshes, sand hills, meadows and aspen and pine woods. May through August are the best times to visit. ..
How to Drive From Edmonton to Lethbridge in 2 1/2 Days: a trip report/site guide by Tina MacDonald. April 24 - 26, 1999. This includes a special section on birding in the Drumheller Valley as well as information on Newell Lake. The E.B.C. can trace its origins back to 1949. Affiliated with the University of Alberta, since the club’s founding fifty years ago, the E.B.C. provides a number of opportunities to watch and study birds in the company of fellow birders. Alberta is located in the Cold Lake area. Over 200 species of bird habitats are supported with clear water lakes, marshy wetlands or mixed wood boreal forest. landscapes of the region are prime habitat for a spectacular variety of birds, and thus offer the best of bird watching opportunities. Here, you can observe many sought-after resident species, neo-tropical migrants, as well as other species stopping over on their seasonal migrations. Although renown for the American White Pelican there are over 230 other species of birds that inhabit these shorelines. seen or recorded in Alberta, Whitney Lakes Provincial Park boasts over 206 of these. Park checklist is included on the site. British Columbia) - by Grant Gussie. From the AlbertaBird E-mail Discussion Group - there are many good places in the area, but a lot depends on how hard you want to work to get to them..
surprising location in the industrial sector of Calgary. ....Weaselhead Glenmore Park Preservation Society - Calgary. Information about these parks in Calgary, including a bird checklist with information about each bird seen. migration in Kananaskis. See also the Check list of the birds of Kananaskis near Mt.Lorette. Alberta Birds of Prey Centre is Canada’s largest birds of prey facility. Situated on a 70-acre wetland area site our centre is a celebration of nature featuring the hawks, falcons, eagles and owls of Alberta. See also Tina MacDonald's report on A Visit to the Birds of Prey Centre. have been protected as a federal migratory bird sanctuary. Now part of Waskasoo Park, the Sanctuary's 118 hectares (almost 300 acres) are set aside as a home for plants, mammals and birds. Five kilometers of trails, a bird blind and viewing decks introduce you to a variety of habitats. Canada, just to the northeast of Red Deer. Visitors are welcome during summer months. In the early 1950's, Charlie Ellis began a project that was to dominate the rest of his life ... he set out his first nesting box for the Mountain Bluebirds. In the years that followed, Charlie and Winnie rimmed the fields with some 300 nestboxes for Mountain Bluebirds and tree swallows, built and erected houses for Black-capped Chickadees, Purple Martins and Flickers, and established a huge program for feeding winter birds. The Ellis farm quickly gained recognition as a sanctuary for all wildlife and Charlie became widely known as Mr. Bluebird, a title bestowed by the well known Red Deer naturalist, Kerry Wood. along the eastern shoreline of the lake right by the front door of the Observatory. Mass migrations of songbirds have been clearly documented at the site. Observers have recorded up to 5,000 migrants in a day. Some birders go so far as to call the LSLBO, "The Point Pelee of the North". delta, with the surface becoming frost-free only between June and September; much of the area is underlain by permafrost. 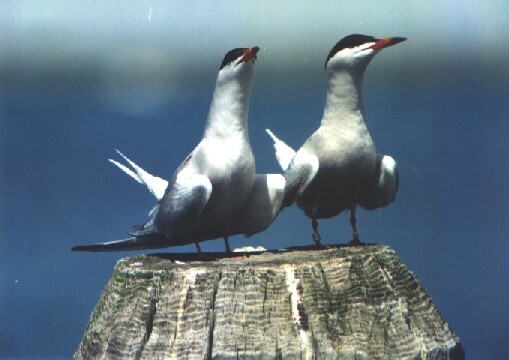 The site is one of the most important nesting, resting and feeding areas for water birds in North America; up to 400,000 may occur during spring migration, with more than one million birds in fall. to the north and west of the Peace River, including a series of eutrophic freshwater lakes, floodplains and river deltas. The site holds large numbers of ducks and geese during spring and fall migrations. See also this mention on the Zama City website, as well as a lot of information about the area. of the Whooping Crane Summer Range, and the Peace-Athabasca Delta (Wood Buffalo National Park section), both of which were designated as Wetlands of International Importance under the Ramsar Convention. More information. by Doug and Arlene Ripley. This richly illustrated trip report covers the area from Great Falls, through Banff, Lake Louise and up to Jasper. ....Alberta & the Canadian Rockies - Trip Report by Alvaro Jaramillo. The participants arrived in Edmonton from all corners of the continent to take part in this exciting trip. ....Northern Alberta Owl Prowl - a photographic essay by Tina MacDonald. our summer holidays in 1988, we used a Canadian Airlines air-pass to visit a variety of sites in western and northern Canada. It was an interesting trip, in a spectacular country, with wonderful weather, and plenty of mosquitos.Ruud and Kitty Kampf are Dutch birders, with a strong interest in the birds of Canada, particularly in out-of-the-way places. birdingpal.com...>> A Birding Pal is not a paid guide, but someone who likes to help out of town visitors. You can become a Birding Pal today! Help someone to enjoy your local birding spots and find a pal to help you when you travel. Click here for Alberta Birding Pals, or join to be a Birding Pal! Preservation Society) - Winter 2001/2002. ....Backwater Adventures - operates out of McLennan, Alberta. Paddle the Peace in the Tradition of the Voyageurs with combination canoeing-birding adventures. found in Waterton Lakes National Park, and Canadian Wilderness Tours can help you find the species you're looking for. Our experienced guides will show you the areas where hummingbirds, loons, herons, and owls are found; you might even see a rare Pileated Woodpecker! with Bruce Bembridge, local Field Naturalist. Neighborhood strolls from your backdoor. Trips to special spots selected from your choice of birds and level of fitness. Happy Birdwatching. Tel: (403)678-6859 Fax: (403)678-6859. Address: Box 3404 Canmore Alberta T0L 0M0. unique look into the past. Relax in the quiet peaceful setting overlooking "Little Beaver Lake." We have all bedrooms facing the lake. Two beautiful verandahs to sit and relax while watching the abundant birds. We have counted over 60 species including, Blue Heron, Geese, Pelicans, Swans, Hummingbirds, American Goldfinch and the list goes on. for current events and field trips. of the Edmonton Natural History Club, the Edmonton Bird Club and the general public are all welcome to attend. 24-25, 2004. Celebrating the annual return of the Trumpeter Swan, this festival kicks off with a slide show Saturday night in Grande Priaire (April 24), wine and cheese, and continues on Sunday at Saskatoon Lake with tours of the birding area, children's activities, and lots of exciting birding activities! Snow Goose festival is in April. Also check Birds of Beaverhill Lake site for checklists. Festival will be held at the Lesser Slave Lake Bird Observatory on June 7 and 8, 2003.
migration at Beaverhill Lake during late September. Daylight tours, kids' programs, evening banquet and silent auction make for an enjoyable day for all ages. Contact: Vanita Eglauer at 780-662-3269 or email tofield@supernet.ab.ca. Semenchuk. Federation of Alberta Naturalists. to determine the "best" place to see each bird.